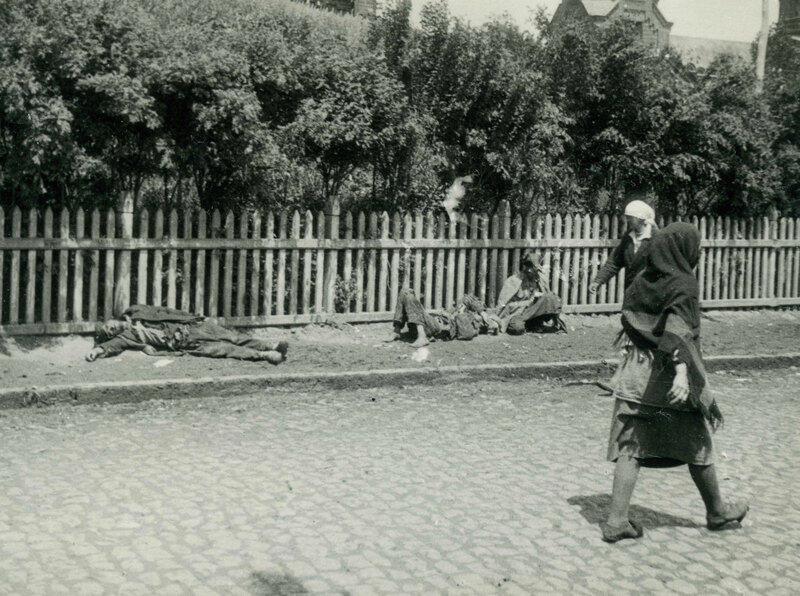 Historians explain the genocide in the Ukraine (and in the northern Caucasus) in various ways. Russian historians see it as an instrument of the destruction of traditional society and the construction, in its place, of a formless, docile, half-enslaved mass of Homo sovieticus. Ukrainian historians (among them Valentin Moroz) believe that Stalin's goal was to save the Imperium: the Imperium cannot exist without the Ukraine. Yet the twenties witness a renascence of Ukrainian nationalistic ambition, which develops under the slogan "Far from Moscow!" 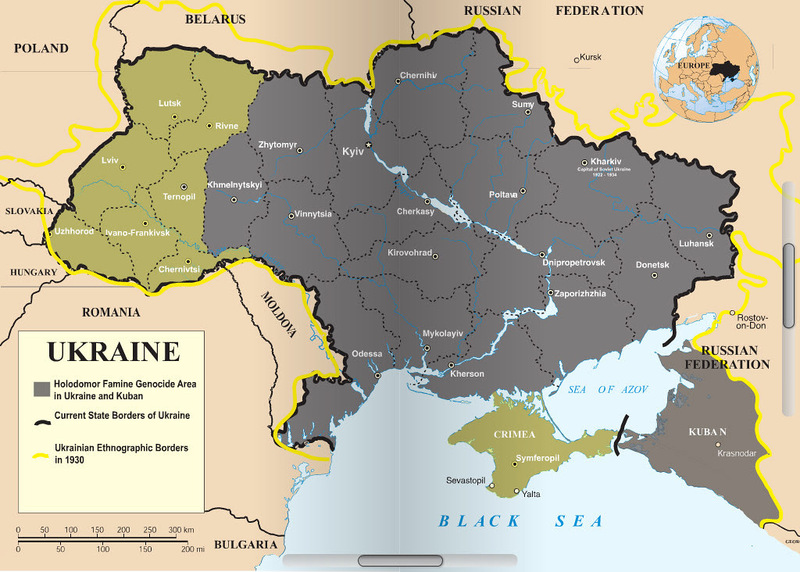 The main repository of the Ukrainian spirit is the peasantry. To break that spirit, Stalin must destroy the peasantry. 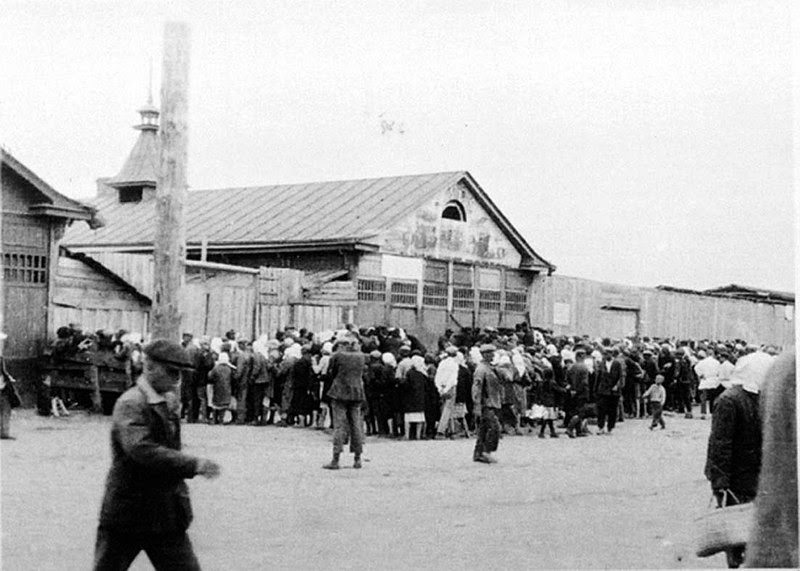 At the time, there were around thirty million Ukrainian peasants. Technically, one could have annihilated a significant portion of them by building a network of gas chambers. But that is an error Stalin did not commit. He who builds gas chambers bears all the blame, brings the disgrace of being a murderer down upon himself. 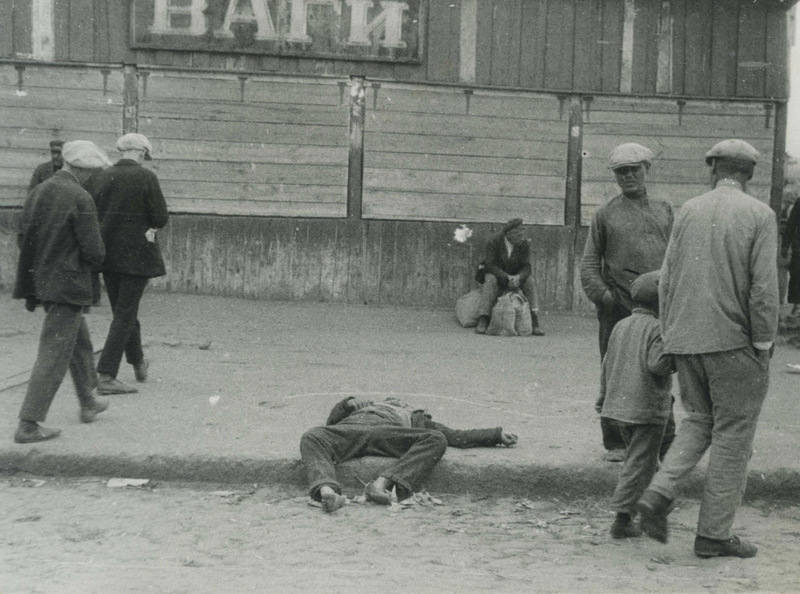 Instead, Stalin saddled the victims of the crime with all the guilt for it: You are dying of hunger because you do not want to work, because you do not see the advantages of the kolkhoz. Furthermore, he complained, because of you the inhabitants of the cities are going hungry, women cannot nurse because they have no milk, children cannot go to school because they are too weak. 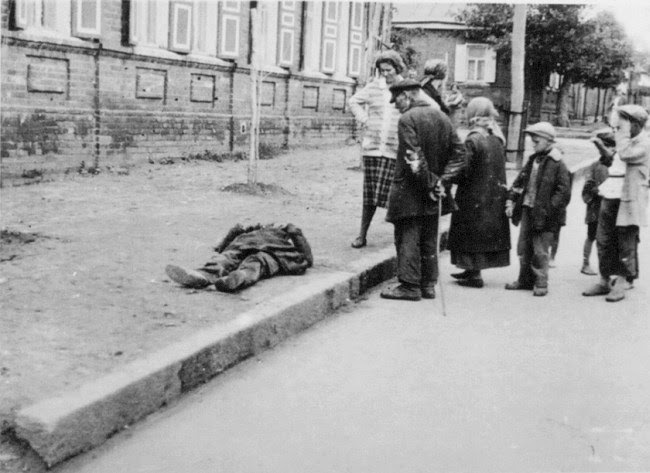 The Ukrainian countryside died in silence, isolated from the world, gnawing on the bark of trees and on the leather laces of its own shoes, looked upon with contempt by people from the cities, who stood in the streets in unending lines for bread. 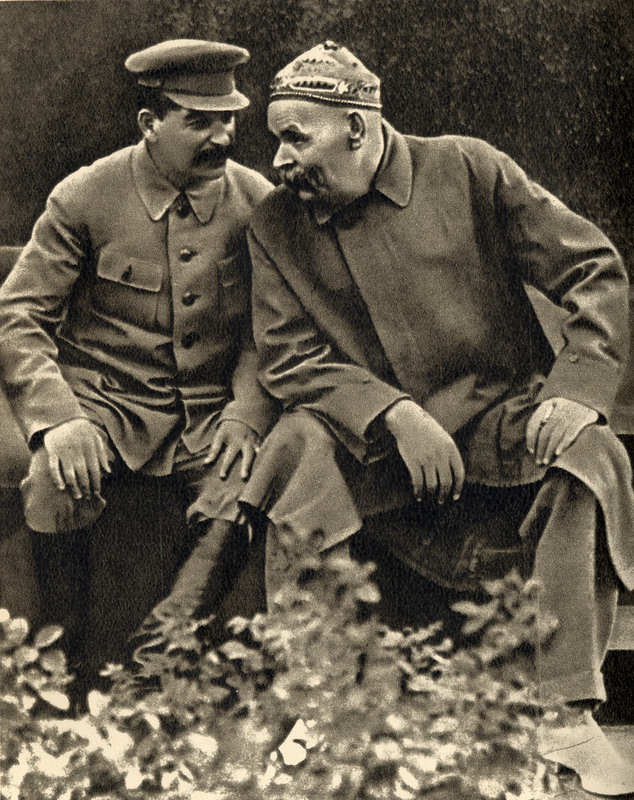 I've always found that photo of Gorky and Stalin troubling. Josef was a dab hand at the PR. This brings the Great Famine to mind. Vlad P may have some ways still to go to catch up with Stalin in the Brutal Despot Sweepstakes. "Stalin is not Russian but Georgian. His cleverness lies in patience, willpower, and good sense. He is confident and obstinate. His enemies accuse him of lacking knowledge and intelligence; they are mistaken. He is not a cultured man in the European sense of the word, not overfed with sophistry and psychological fanaticism. Stalin is a barbarian, in Lenin’s sense of the word, an enemy of Western culture, psychology and ethics. His intellect is entirely physical and instinctive, in a natural state, and without the prejudices or the moral sense of a cultured man. It has been said that men reveal their character in their bearing. I saw Stalin in May 1929 at the Pan-Russian Soviet Congress, walking up on to the stage in the Grand Theatre of Moscow. I was just below the footlights in the orchestra stalls when he appeared from behind a double row of the People’s Commissaries, the delegates from Tzic and the members of the Party’s Central Committee, lined up on the stage. He was quite simply dressed in a gray jacket of military cut and dark cloth trousers gathered into his high boots. Square-shouldered, short, thick-set, his massive head covered with black curly hair, and narrow eyes accentuated by very black eyebrows; his face was darkened by shaggy black moustaches; he walked slowly and heavily, striking the ground with his heels as he went; his head thrust forward and his arms swinging made him look like a peasant, but a peasant from the highlands -- hard, patient, and obstinate. Ignoring the thunder of applause which greeted him, he walked on slowly, took his place behind Rykoff and Kalinin, raised his head, looked at the huge crowd which acclaimed him, and stood motionless and stooping slightly -- his eyes fixed straight in front of him. About twenty Tartar deputies, representing the autonomous Soviet Republics of the Bakirs, the Bouriat-Mongols, Iakouts, and Daghestan alone observed a rigid silence in their stage-box. They were dressed in yellow and green silk kaftans, with silver-embroidered tartar caps on their long black shiny hair and they stared at Stalin with little narrow slit eyes: at Stalin the dictator, the iron fist of the Revolution, mortal enemy of the West and of civilized and bourgeois Europe. When the delirious shouts of the crowd began to die down, Stalin slowly turned his head toward the Tartar deputies: the Mongols’ eyes met those of the dictator. A great shout filled the theatre: it was the greeting of Proletarian Russia to Red Asia, to the people of the plains, the deserts, and the great Asiatic rivers. Again Stalin turned coolly to the crowd. He remained bent and motionless, his unseeing eyes fixed straight in front of him." By the way, I hope it will seem redundant to point out that RK's book is a magisterial work of personal observation, reflection, reminiscence and historical reportage. Your characterization of RK is right on. He was also a photographer and poet. A less poetic but equally devastating (that word is far too weak) treatment of the Ukraine's cycles of suffering is found in Timothy Snyder's Bloodlands: Europe Between Hitler and Stalin. Thanks very much David. I believe I had assumed this writer's work would be known to everybody interested in history. Or perhaps I should say, I believe I had assumed some people are still interested in history. As RK modeled his approach upon the example of Herodotus, I think it's probably safe to assume he was interested in the writing of history. Of course, suffering and history are wicked-kissing cousins, and that fact would go a long way toward explaining the contemporary lack of interest in either. Ignorance goes down better with a blintz, as they used to say around the deli.